Feline Greenies Dental Cat Treats, Catnip Standard Packaging 11 oz. Feline Greenies Dental Treats for Cats Tempting Tuna Standard Packaging 11 oz. Contains one (1) 30 oz. 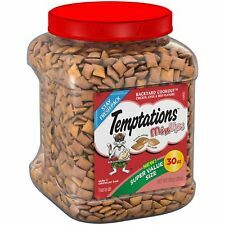 tub of TEMPTATIONS Treats for Cats Tasty Chicken Flavor. TEMPTATIONS Cat Treats are 100% nutritionally complete and balanced for adult cat maintenance. Your cat can't wait to get their paws on TEMPTATIONS Tasty Chicken Flavor Crunchy Cat Treats. Contains one (1) 30-oz. tub of TEMPTATIONS Classic Treats for Cats Savory Salmon Flavor. Temptations treats for cats have no artificial flavors and are 100% nutritionally complete. 100% nutritionally complete and balanced for adult cat maintenance. Chicken Flavor. Usually within 24 hours. Trending at $14.27eBay determines this price through a machine learned model of the product's sale prices within the last 90 days. Contains one (1) 30-oz. Temptations treats for cats have no artificial flavors and are 100% nutritionally complete. 100% nutritionally complete and balanced for adult cat maintenance. Your kitty will nuzzle up to you after tasting the savory flavor of TEMPTATIONS cat treats. Contains four (4) 3 oz. TEMPTATIONS Cat Treats are 100% nutritionally complete and balanced for adult cat maintenance. This low-calorie cat treat has a crunchy outside with a soft center that cats love. TEMPTATIONS Classic Treats for Cats Tantalizing Turkey Flavor feature a unique pocket shape that is delightfully crunchy on the outside and scrumptiously soft and creamy on the inside that your cat will love. FELINE GREENIES Oven Roasted Chicken Flavor Dental Cat were designed to help keep your cat's mouth clean and healthy. With their unique shape and crunchy texture, these cat snacks are proven to clean teeth and reduce tartar. Item color: Squeeze Up. You're already purchasing the item. Item part number: 3270015524. Item MPN: 80032700155243. Feeding options: by hand, into a bowl, or as a topper. Manufacturer: Hartz. Treat your cat to a delicious snack and essential health benefits with FELINE GREENIES SMARTBITES Treats for Cats. Your cat will also love the tuna flavor of our healthy cat treats. Contains one (1) 2.1-oz. Made With the REAL Salmon Your Cat Craves. Dogs Cats Small animals Horses Reptiles Fishes Birds. Small Animals. This is prohibited by law. USEFUL LINKS. We know you are excited to receive your stuff. And with none of the ingredients that are unacceptable for your cat’s discerning diet, it’s perfectly okay to reward him just a little more often—especially since there’s less than 2 calories per treat. 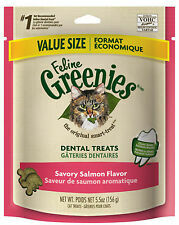 FELINE GREENIES are the healthy, low-calorie cat teeth cleaning treats you've been looking for. Give your cat FELINE GREENIES Dental Treats and you're sure to stir up fresh, healthy, happy purrs of joy. Mixup Treats For Cats 16 Ounces Value Size W/ Chicken Catnip Cheddar Flavor. ’Tis the season for delicious cat treats! Your feline friend will adore the tempting mix of chicken, cheddar, and catnip flavors. These lickable treats for cats are made with farm-raised chicken! You can also pour them into a bowl or use as a tasty topper on wet or dry food. Made from hand-cut portions of responsibly harvested tuna. Contains Four (4) 3 Oz. 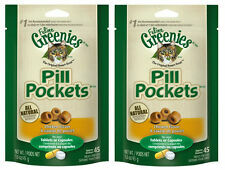 But you’re smarter… because you’ve got FELINE GREENIES Pill Pockets. Data on file at Mars Petcare US, Inc. 2017. These all-natural treats are a healthier alternative to using human foods, because they have fewer calories and less fat and sodium. A natural and delicious treat for your pet! Bonito flakes are among the highest quality flakes on the market and they are derived from a single protein source, making them a healthy choice when rewarding your pet. One (1) 13.5 Oz. Canister Of Purina Dentalife Salmon Flavor Cat Treats. Care for your cat's oral health by making Purina DentaLife Savory Salmon Flavor adult cat dental treats part of her regular routine. (5.0 mg/ml Gentamicin sulfate) is a clear, colourless solution available as. keratitis, blepharitis, and hordeolum, caused by gentamicin-sensitive pathogens;. Dexa-Gentamicin is indicated in infections of the anterior eye including conjunctivitis. These tasty treats are the purr-fect way to pamper your kitty because they contain 100% complete and balanced nutrition for adult cats. Tear open a pouch of Purina Friskies Party Mix Natural Yums With Real Salmon With Added Vitamins & Minerals adult cat treats to delight your precious pet with tasty flavor and high-quality ingredients. FELINE GREENIES 2.5 oz Crunchy Dental Cat Treats Cleans Teeth Freshens Breath! FELINE GREENIES Oven Roasted Chicken Flavor Dental Cat were designed to help keep your cat’s mouth clean and healthy. With their unique shape and crunchy texture, these cat snacks are proven to clean teeth and reduce tartar. Also Try our Liver Bits Treats for Dogs PureBitesreg; are made with only 1 ingredient; 100 Pure USDA Inspected Chicken Breast in the USA. Cats love the taste of PureBitesreg; because our treats are freeze dried RAW to lock in the aroma, texture and freshness they crave. May contain trace amount of peanut. Made with fresh salmon. Ideal for adult cat. New unopened Catwine. Free shipping US only. Please ask any questions before buying! These lickable treats for cats are made with real, deep sea tuna or farm-raised chicken! You can also pour them into a bowl or use as a tasty topper on wet or dry food. Calorie Content. Purina Pro Plan Dental Crunch Chicken & Liver Cat Treats (1.8 oz.). Any treat that supports your cat’s health while also satisfying their craving for savory flavors is one worth handing out regularly. FELINE GREENIES SMARTBITES Hairball Control Treats Cats Chicken Flavor 2.1 oz. Cheap!! Sheba Meaty Tender Sticks For Cats. 6 Packs ( 3 Chicken, 3 Salmon).